This story is dedicated to Mary Janet McConnell Smith, the daughter of William Watson McCONNELL and a granddaughter of Isabella WATSON and her husband John McCONNELL. Mary was born in Seattle, lived in Montana and now lives in Tennessee, USA. Mary has been, and continues to be, central to the research and interest in the story of Isabella and John McConnell and their descendants. William Watson McCONNELL was born on 16 February 1902 at Carcluie Cottage, Ayrshire, Scotland, the youngest child of John McCONNELL and his wife Isabella WATSON. Young William’s world was shaken when his mother, who likely had been ill for some time, died unexpectedly on 11 June 1904 after an operation at the Western Infirmary in Glasgow. Additionally – for a reason unknown at the present – his father was no longer employed in his lifelong occupation as a gamekeeper, and appears to have had difficulty supporting his large family. All this for two year old William to cope with. Suddenly the McConnell family was motherless. Although it is not clear how the family managed it seems likely that William’s 21 year old sister Mary (Mary Hunter Morton McCONNELL), as the eldest child and daughter, may have become his surrogate mother. His brothers, 19 year old John (John McCONNELL) and 17 year old Thomas (Thomas Watson McCONNELL) would have completed school and worked outside the home; John as an apprentice joiner and Thomas as a clerk. William’s older sisters, 15 year old Janet (Janet Watson McCONNELL), 13 year old Isa (Isabella Watson McCONNELL), and 9 year old Elizabeth (Elizabeth Wyllie McCONNELL) still attended school. William was the baby of the family and, if his mother was ill for many months before her death, he may not even have had much memory of her. It seems fairly certain that William’s grandmother, Mary HUNTER, would come and stay with the family. Also, William’s aunt and uncle Janet (WATSON) and Gilbert SPEIRS helped wherever they could. Strong ties were also maintained with William’s uncle Thomas WATSON and his wife Jane MUIR. Over the next few years, William was likely cared for by a variety of immediate and extended family. He seems to have been particularly close to his sister Isa. No doubt many extended McConnell-Watson-Speirs family discussions occurred; not only about their own individual futures, but also what could and should be done about the young McConnell children? Not only was the McConnell family motherless, but John, the father, had for some reason no further work as a gamekeeper and the family had left their home of Carcluie and were in rented accommodation. What could be done? In the early 1900s deliberations began about a possible move to the ‘new world’ of North America. Newspapers were filled with advertisements extolling the virtues of this new land: job opportunities abounded; all skills were required and welcome; land was available for purchase and in some cases basically ‘free’; the climate was healthy; plenty of food was easily grown; the strict class society was not followed. And this new land offered adventure. The younger members of the family were likely enthusiastic about the move. They could see that life as their parents knew it did not offer the opportunity and future that they wished for. The older generation likely were more reluctant to change their ways and routine and were understandably hesitant about a move to the other side of the world. William, although he was only young, likely listened intently as his father, siblings, aunts and uncles and cousins discussed back-and-forth the pros and cons of emigration. Photos left: William about 3 years old, taken in Scotland about 1905. From the collection of Mary Smith. In the photo where he wears the cap, it is easy to imagine William listening intently to a dinner table conversation about emigration. In October 1905 another blow struck the McConnell family when William’s 18 year old brother Thomas died of tuberculosis. It is not known whether Thomas, who had worked as a railway clerk, had been enthusiastic about emigration. In the heyday of railway development in western Canada he certainly would have had opportunity for work if he had moved. However, his death from tuberculosis may also have encouraged the other family members in their search for fresh air (of which western Canada certainly had an ample supply) as well as land and opportunity. 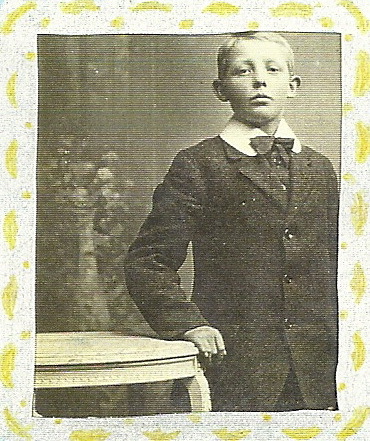 The first to move, in June 1906, was a Watson cousin, 17 year old James (Jim) Muir WATSON. Jim sailed to Montreal and then went by train to Manitoba where he worked as a farm labourer to save up money to buy his own land. 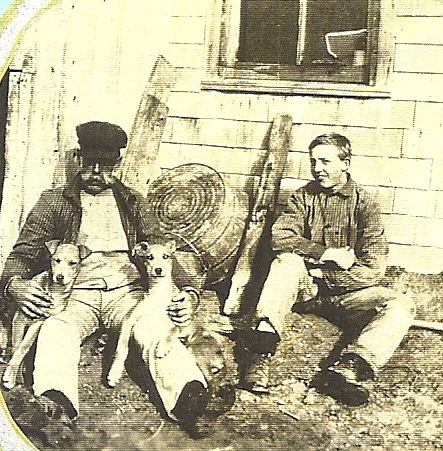 Although William didn’t know it at the time, ten years later he was to stay with Jim and his Canadian wife on the Saskatchewan farm that Jim had purchased. William likely continued to live with various family members and the to-emigrate-or-not-to-emigrate conversations continued. We know that the Speirs considered the move. 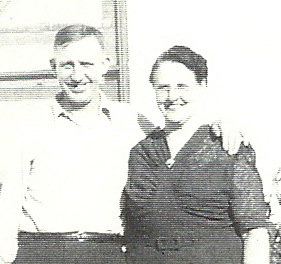 In April 1910 William’s uncle Thomas Watson and his aunt Jane, and their children moved to Saskatchewan. Their move meant that the entire Watson family, with the exception of one son, had left Scotland. One of William’s support families had disappeared from his life. The 1911 census found William as a ‘visitor’ with his aunt Janet and uncle Gilbert Speirs. A year later, in November 1912, that support family disappeared as well when Janet, Gilbert and their daughter Janet sailed for Canada. With them went William’s sister, 17 year old Elizabeth. They all headed to the Wolseley, Saskatchewan area where the Watson family had settled. For William, Elizabeth’s move meant another sibling gone. It appears that most of the remaining McConnell family decided to join the others and it was decided that William and his older sister Isa should emigrate and join the other families in Saskatchewan. Family stories indicate the William’s father John planned to move; he would likely feel responsible for his son William who was still a minor. Bad fortune struck the McConnell family again, when in January 1913, William’s father died suddenly and unexpectedly after brief four day bout of “acute pneumonia”. However likely the travel plan had already been made, the tickets already purchased. On July 5th, 1913 William, 11 years old, and Isa, 22, left Glasgow on the ship S.S. Letitia for the ten day trip to Montreal. Photo right: William about 11 years old. From the collection of Mary Smith. This photograph may have been taken in Scotland, as a formal portrait, before William got on the ship S.S. Letitia. The arrival in Montreal would have been followed by a train ride to Wolseley, Saskatchewan. By the end of 1913 most of the extended McConnell-Watson-Speirs family had left Scotland. The only two McConnell family members to remain in Scotland were William’s older sisters Mary and Janet. 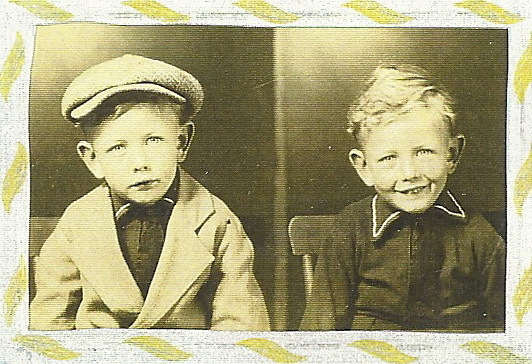 Photo left: Gilbert Speirs and William, 1919, taken in Ellisboro, Saskatchewan, Canada. From the collection of Mary Smith. Family stories indicate that when William and his sister Isa arrived in Canada their older brother John met them and stayed with them for a month at the home of Janet and Gilbert Speirs in Ellisboro, Saskatchewan. If this is the case John would have travelled from New Jersey to Montreal to meet their ship and then travelled to Saskatchewan by train with William and Isabella. Not much of William’s life in Saskatchewan is known. He must have gone to school since he was 11 years old when he arrived in Canada. It is not known when he moved permanently to the USA. His family believe he crossed the US / Canadian border ‘many times’. By 1920 his sister Isa had moved to the USA and married Ernest PIERCE in Shellby, Montana. In 1921, William went, perhaps not for the first time, from Canada to the USA, and again in August of 1922 at Seattle, he went to Shellby, Montana. 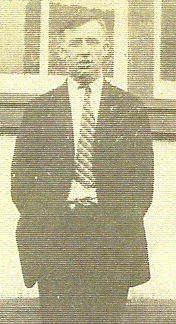 Photo below right: William, about 1928. From the collection of Mary Smith. Sometime later he joined the US military. 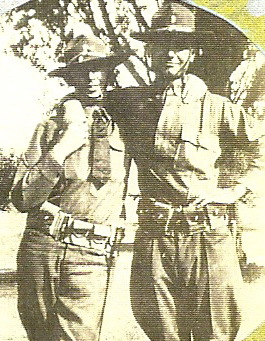 Photo left: William (on left) with an unidentified army buddy. When in 1930 he married his first wife, 18 year old Ruth Leona DAVIS, he was in the Army at Fort Lawton in Seattle with the Third Engineers. Ruth was born in 1912 in Washington state and died in Florida in 1992. 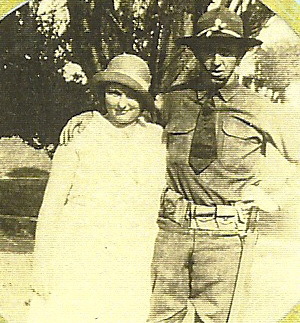 Photo left: William and his 1st wife Ruth Davis, 1933. This and the above photos from the collection of Mary Smith. Ruth and William McConnell had three children; Mary Janet McCONNELL (born 22 May 1933); William (Billy) Lyle McCONNELL (born 22 May 1937); and Bonnie Jean McCONNELL (born 29 June 1938). All of the children were born in Glasgow, Montana; William’s eldest child Mary believes her father worked as a fireman during the building of the Fort Peck Dam. The children were born during the depression years and work was hard to find; a job at the Fort Peck Dam construction would have been welcome. William’s daughter Mary picks up her father’s story. “In 1940 my dad re-enlisted in the Army at Glasgow, Montana for two years, in 1942 he re-enlisted, this time in Butte, Montana. During this tour of duty he was shipped to New Guinea to clear jungles and build air fields. He was one of the first ones there and I have more than fifty pictures of natives in New Guinea. While my dad was at war, my mother Ruth, on June 23, 1943, put my sister, brother and I in an orphans’ home in Great Falls, Montana. My sister Bonnie Jean died on April 7, 1944 of diphtheria. Photo right: William and his 2nd wife Lulu. 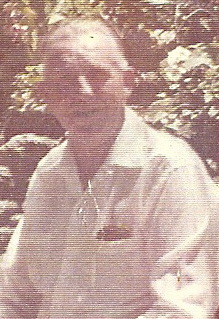 Photo taken sometime between 1944 and 1956. Photo is from the collection of Mary Smith. Mary’s story continues: Between 1945 and 1948 I don’t remember too much but my dad did work on the Great Northern rail line. Lulu is the one who raised my brother and I after Dad got out of the army. In 1949 we moved to Troy, Montana. I think the Rail Line transferred my father. We rented a piece of land, that had a horse barn on it. My father converted the horse barn into a home for us to live in. Down stairs was divided in half by a blanket that made a kitchen and bedroom. Upstairs was divided in half so my brother and I each had a bedroom. The stairway to our upstairs bedroom was on the outside of our house. There was no electricity, running water or indoor plumbing. In 1958 dad married his third wife, Mary ALFORD. Mary was born in 1901. She and dad were married in 1958 in Coeur d’Alene, Idaho. 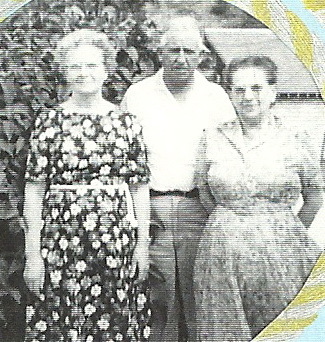 Photo left: William with his wife Mary (woman on left side of photo) with an unidentified friend. Photo taken between 1958 and 1967. From the collection of Mary Smith. On 23 March 1960 my brother William (Billy) Lyle McConnell died at Camp Pendleton, California. He was in a special outfit in the Marines. He was coming home to put on a show at the fairgrounds for Memorial Day and was killed in a car accident. In 1965 when Dad came down to Florida to meet my husband, Clifford Smith, and my daughter, I had been away from home for sixteen years, since 1949.